CheekyLea: Oviparous . . . SHARK!!!!!! Oviparous . . . SHARK!!!!!! Okay, the plan is not for this to become a page devoted to weird facts about sharks. However, over a hundred sharks (about 25%) lay eggs! They lay eggs, have no bones, can live up to 100 years, and their skin is resistant to microorganisms (to the point that scientists are beginning to conduct research in using sharkskin suits for cancer patients with reduced immune systems - more info here). I was aware of all the information listed above except for the oviparous part. My mind is blown. And if your mind is not blown yet then check out the picture below. 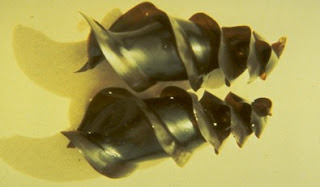 It features a couple of horn shark eggs. Also, the whale shark is noted for laying the world's largest egg. It was 14 inch. long. That is a length to make boys envy. And, as an added bonus I will let you know that one shark went 15 months without eating. A length to make girls envy (down with anorexia!). And the bull shark, or Zambi (depending on its location) can swim in both fresh water and salt water. It is also responsible for the majority of human attacks, the aggressive bugger.